Contemplating a home purchase? You’ve probably heard about closing costs. We’re assuming you’ll want to keep those as low as possible, right? Right. Closing costs can come in at up to 5% of your home’s purchase price, so they’re not exactly small change. Let’s talk about some tips on how to reduce closing costs. When you’re negotiating a home sale, your lender will provide you with what’s called a Loan Estimate (previously known as a Good Faith Estimate or GFE) detailing what your closing costs are likely to be. The problem is that the many fees itemized on that Loan Estimate can be hard to understand. We’ve translated some of the common fees below. Loan origination fee: the amount charged by your lender for administrative costs associated with creating and processing the mortgage. This is also known as an underwriting fee. Application fee: the fee associated with reviewing your mortgage loan application. Credit report fee: the fee that covers the cost of pulling and reviewing your credit report. Point charge: the amount of money that you may pay for points in order to reduce your interest rate. Title search: the cost for the title insurance company to perform a search on the title of the home. Lender’s title insurance: the cost to insure the title for the lender. Owner’s title insurance: the cost of title insurance to protect you, for the full value of the home. This cost is optional. Pest inspection: the cost for the home inspection, which will satisfy the lender that the home has no major pest-related defects. Home appraisal: the cost for the appraiser chosen by the lender to assess the value of the home. Flood determination and monitoring fees: these fees go to the company that determines whether the property is in a flood zone, and continues to monitor the property as flood maps change. Tax monitoring fee and tax status research fee: these fees go to a service provider that monitors your property tax payments and reports any property tax slip-ups to the lender. Courier: the fee passed on to you for the lender’s expense of sending official documents by courier or messenger. Survey: the assessment of a property that discloses boundary lines, gas lines, roads, walls, easements, encroachments and improvements on the property. Attorney, closing and settlement fees: legal fees from attorneys’ reviewing documents and agreements, plus escrow fees. Government recording fee: the fee paid to the government to officially record the change of ownership for the home. Transfer taxes: a government charge based on the amount of the mortgage and the purchase price. Mortgage Insurance Premium: if you have an FHA loan and your down payment is less than 20% you will have to pay the mortgage insurance premium. That includes an Upfront Mortgage Insurance Premium paid at closing and a monthly charge. Escrow property taxes: the advance property tax payments that the lender requires, to be held in escrow. Prepaid daily interest charges: the amount of pro-rated interest that will accrue on the mortgage between the settlement date and the beginning of the first full month of your mortgage. 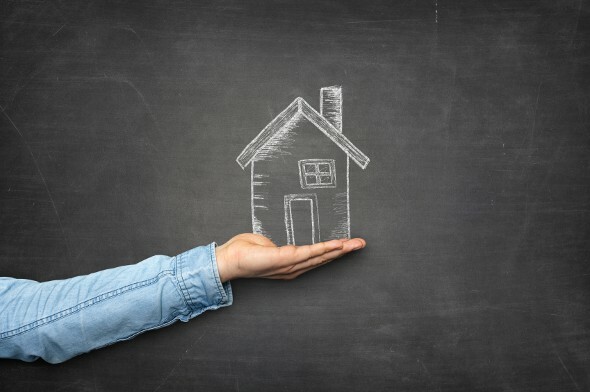 Mortgage insurance: if you don’t have an FHA loan and your down payment is less than 20% you will owe what’s called private mortgage insurance (PMI). PMI comes with monthly premiums, but you may be asked to make a deposit of two months’ premium charges. Prepaid homeowner’s insurance: the advance homeowner’s insurance payments that the lender requires before closing. Rate lock fee: a fee to lock in the rate the lender offers you. Phew. That’s a lot of potential fees and charges. With closing costs, a lot of money is on the line. That’s a good reason to shop around for the lender who offers the lowest closing costs. You can also ask a lender to match low closing costs offered elsewhere. Besides getting quotes from multiple lenders, you can get quotes for some services as well. There are some services included in the closing costs (the pest inspection fee, the survey fee, the title search, etc.) that you are allowed to shop around for. In other words, you don’t have to go with the provider your lender suggests and you can try to find a lower price elsewhere. The closing cost services you can shop for will be listed as such on your Loan Estimate. Do some research, make some calls and see if you can find cheaper options. When you get the Loan Estimate, don’t just glance at it. Take the time to go through each item with the lender, questioning what each fee covers—and why it costs as much as it does. This is a good way to identify padded or unnecessary fees. Also, keep an eye out for fees with similar names, as they may mean the lender is charging twice for doing the same thing. 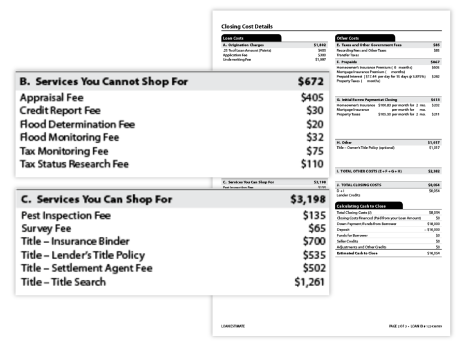 A common example: processing fees and underwriting fees. Closing costs have gotten clearer since the Loan Estimate replaced the GFE, but it’s still worth reviewing your Loan Estimate carefully. Once you have a handle on the fees the lender wants you to pay, you can start negotiating. Ask for more obscure fees to be knocked off the final price tag. Ask your lender to give you what’s called the Closing Disclosure form (detailing your final closing costs) as soon as it is available. Compare what’s on the Closing Disclosure to what was on the Loan Estimate and ask your lender to justify any discrepancies. Remember the pre-paid daily insurance charges from the list above? You can minimize those charges by closing at the end of the month. Plan ahead and try to schedule your closing when it means you’ll have to pay less money upfront. If you’re buying in a low interest-rate environment, you probably don’t need to pay extra for points to lower your interest rate. Each point will cost 1% of the loan value, so paying for points can add up fast. And you pay that money upfront as part of the closing costs. For each point you buy, you’ll have to stay in the home for longer if you want to break even. If your home has been appraised recently, you can probably skip the cost of having it appraised again as part of the closing process. Ask your lender for an appraisal waiver. If you can’t waive the appraisal altogether, you may be able to save money by opting for an automated appraisal instead of a full appraisal. Ask for a “re-issue rate” (read: cheaper rate) when you re-up your title insurance for a refinance. What is this magical thing called a no-closing cost mortgage, you ask? It just means that you’re paying the closing costs in another way, not up front. So, you might roll the closing costs into the amount of your mortgage, or you might get “free” closing costs in exchange for a higher interest rate on your loan. Both these “no-cost” options will often cost you more in the long-run if you plan to stay in the house for a long time. If you know you want to be in the home for more than, say, 5 years, you may want to pay the closing costs up front if you can afford it. The exception to this would be people paying off high-interest debt like credit card balances. If this is you, paying down the high-interest debt rather than putting the money toward closing costs may make sense. We know there are a million ways you’d rather spend your money, but closing costs are a necessary step to homeownership. You don’t have to like them, but you do have to pay them, one way or another. It’s best to focus on how to reduce closing costs so you aren’t paying more than you have to. 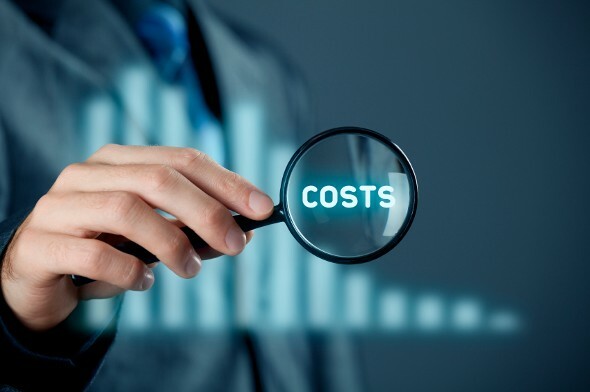 How will "fees" impact closing costs?